Arrowhead Park was envisioned more than 30 years ago when the original acreage was being acquired. The parcels that were acquired by the company formed an irregular shape bounded by Holland Road, the Ohio Turnpike, I-475, Salisbury Road and the quarry. 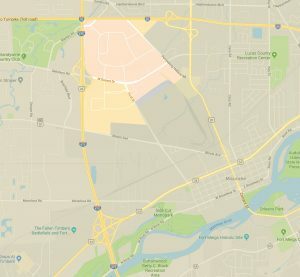 Today, the boundaries extend from the centerline of Holland Road to the turnpike, I-475/US 23 on the west, south to Illinois Avenue, and east to Conant Street . About 400 acres of land is yet to be developed, primarily in the western half of the park. Today, included in the park, is a 6 acre area, named for the late Edward J. Eppstein, who is widely regarded as the driving force behind Arrowhead Park. In 1975, Mr. Eppstein founded the Webstrand Corporation, a multi-faceted development company that was involved in the downtown Toledo Four SeaGate Building and several other Toledo area projects in addition to Arrowhead. It was Mr. Eppstein who came up with the Arrowhead name, to reflect the Indian history of the site. Ed felt there was a great opportunity here, and that the development should be done well. Ed Eppstein was a key player in keeping the quality up and the project moving, Mr. Anderson recalls. 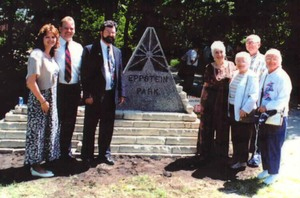 It was in 1985 that Mr. Eppstein worked closely with the City of Maumee and other owners in Arrowhead to get the unique CM zoning designation, an important factor in the Park’s success. CM zoning provides for flexibility in using parcels anywhere in the Park for commercial, retail, or light industrial purposes. It also required adherence to a strict set of plat restrictions and regulations. All site plans, building materials, signage, and landscaping have to be approved by an architectural committee made up of Arrowhead property owners. Development efforts—particularly commercial development—received a major boost with the opening of the $4.7 million I-475 interchange at Salisbury Road in July 1989. The Salisbury interchange, along with the adjacent Exit 4 of the Ohio Turnpike and connections to I-75, give Arrowhead direct access to the entire region. Transportation advantages, the beautiful site, and ease of location in the park have continued to attract businesses. A job creation and retention program enacted by Maumee City Council in February 1992, has also helped. Arrowhead Park today has more than 100 buildings and is home to over 250 businesses with well over 14,000 employees. In late 1992, a small steering committee of Arrowhead Park business leaders organized by Dale Fallat of The Andersons began to meet. From these meetings the foundation of the Arrowhead Park Association began to take shape. Association and dues structure as well as the Code of Regulations was developed. A nine member Board of Trustees and Officers were elected and seven standing committees established. In March 1993, the Association was incorporated in the State of Ohio and is currently recognized as a 501(c)(6) Business League. A special planning meeting of the Trustees was held in 1995 and a decision was made to develop the Arrowhead Park Association to an even better organization than what was already a successful organization. The Board was increased from nine members to fifteen. A part time secretary was hired. A package of membership benefits was developed. A yearly Park-wide solicitation for APA Membership was outlined and developed. The Board of Trustees and committee Chairpersons meet monthly to discuss current business, activities and projects.